Though challenges to the service’s dominance have come and gone, Paypal remains the leading payment processor online for virtually every country where internet access is available and uncensored. It’s easily the payment and donation method of choice on sites like eBay, and it has enjoyed a steady reputation as the leading way to earn and process revenue on WordPress blogs in recent years as well. That’s really no surprise: Paypal was purchased by eBay nearly a decade ago, and eBay has thrown a significant amount of money behind promoting the company as the single best online payment processor in the world. Combined with its low fees, easy use of both electronic checks and credit cards, and its straightforward administration interface, Paypal has simply outclassed and outpaced the competition in every aspect. This dominance in the marketplace virtually necessitates that many WordPress users integrate Paypal into their websites in some fashion. It’s a piece of functionality that is actually not supported by a standard installation of the WordPress content management solution out of the box, and it must be enabled by using plugins, XHTML code, and good design sense. The great thing about Paypal is that it actually can be used in a multitude of different ways, allowing its functions to adapt to shopping cart environments, membership or premium content subscriptions, and even basic donations or “tips” sent to individual blogs or authors online. Each of these implementations requires a slightly different plugin and a slightly different approach when integrating Paypal into an existing WordPress environment. For those who are new to this type of integration, or those who are transitioning form other methods of passing and processing payments, this tutorial will cover the best ways to bring the world’s most popular payment processor into WordPress in a few easy steps. Several years ago, the WordPress Extend gallery of plugins contained a path to Paypal integration that was known as the “Buy Me a Beer” plugin. Its clever name was largely due to its functionality. Rather than enabling traditional e-commerce applications, or promoting a subscription model, the “Buy Me a Beer” plugin was designed specifically to allow everyday blog readers to donate to an author’s Paypal account if they enjoyed the content that they read on the author’s website regularly. The process was entirely optional, and a large number of reputable WordPress bloggers promoted it as a method of “tipping” an author if their content was well-reasoned and enjoyable. That plugin has since vanished from the collective consciousness of the WordPress community, its developer having moved on to bigger pursuits. The main goal behind the plugin, however, is still one that authors tend to prefer and employ on a regular basis. The logical successor to the “Buy Me a Beer” style of plugin is the newer “Paypal Donations” plugin available at the current iteration of the WordPress Extend plugin gallery. This plugin, with a much more straightforward name, enables the same functionality that could be accomplished by encouraging regular readers to buy the author a beer. 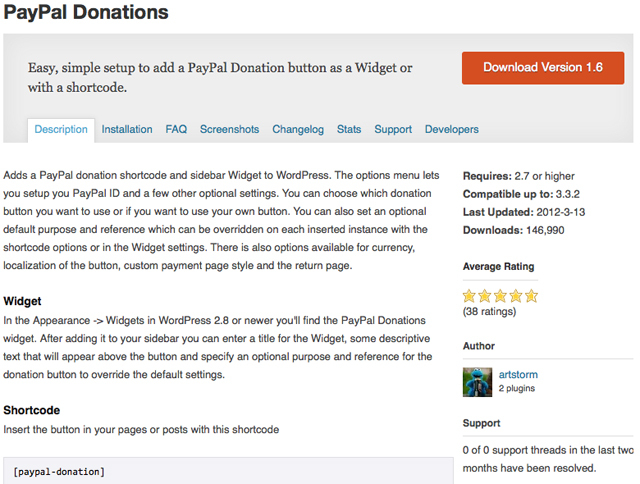 The Paypal Donations plugin is far more modern and advanced than its predecessor, however, and has a number of features that will specifically cater to novice WordPress administrators and authors. First and foremost, the plugin leaves behind the “buy me a beer” language. The earlier plugin actually urged users to do just that — and that made the plugin a little unsavory for some authors and some kinds of websites. Instead of the “beer” language, the Paypal Donations plugin employs basic donation buttons that can be found on the Paypal website within its own “tools” area of the administration interface. 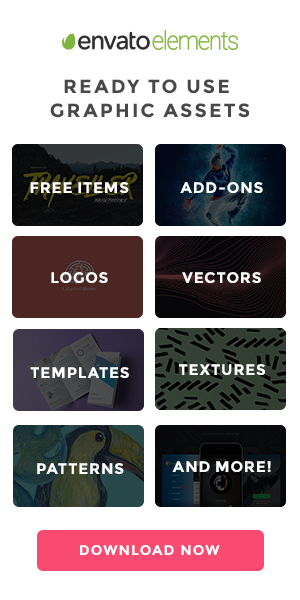 These buttons can be placed into standard template files using a few distinct methods. This basic shortcode uses the default options without any parameters for further customization. Every part of the donation button’s appearance when displayed with this simple shortcode can be controlled using the custom control panel page in the Dashboard. This more advanced shortcode allows the author to categorize the donation button and list its specific purpose. 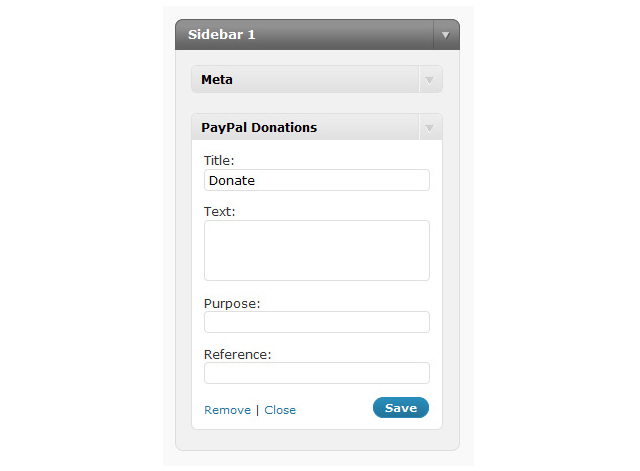 This information is placed alongside the donation button and is styled using built-in CSS code that is bundled with the plugin when it is uploaded to the server or installed using the native WordPress Dashboard plugin interface. The plugin can be made to work as soon as the user enters their Paypal ID into the relevant box within the plugin’s customized control panel page in the WordPress Dashboard. From that moment on, any donations will automatically be placed into the author’s or administrator’s Paypal account, less a small percentage fee subtracted by Paypal itself. Paypal is an excellent way to turn a blog into a place where users can donate to, or “tip,” their favorite website’s authors and administrators. But it’s also a great place to start selling a product and monetizing both a site’s content and the products that its content inspires. Plenty of WordPress authors and administrators are looking to set up an e-commerice solution that will allow them to sell things like electronic books and special, feature-length articles. Strong Paypal integration into a shopping cart solution is the best way to accomplish this while working with one of the biggest standards online when it comes to payment processing for both administrators and their readers alike. 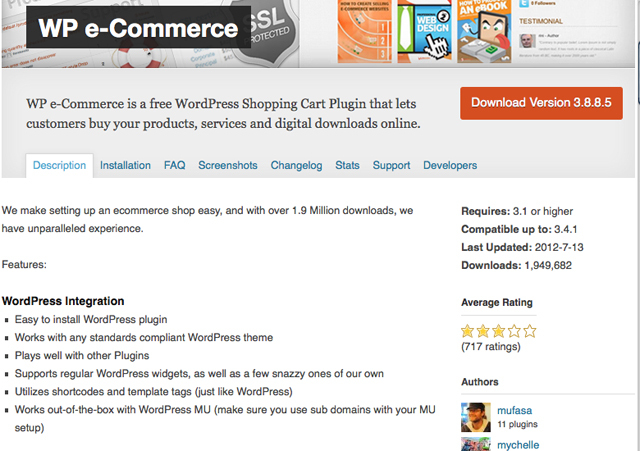 While WordPress has a number of great ways to integrate Paypal and e-commerce solutions using plugins, none of them is quite as adept at performing this function as WP Ecommerce. The plugin, which started out as the simple “WP E-Commerice” plugin some years ago, has greatly matured over the past several years and is now a leading way to sell products and enable payment on a typical WordPress blog. The plugin originally supported only the Paypal payment processing service, but has expanded its reach in recent years to cover things like Google Checkout, Authorize.net merchant accounts, BluePay, ChronoPay, and numerous other, smaller payment processing websites. For this reason, the plugin is the best way to allow users to pay for goods and services using virtually any service where both they and their favorite website have an account. 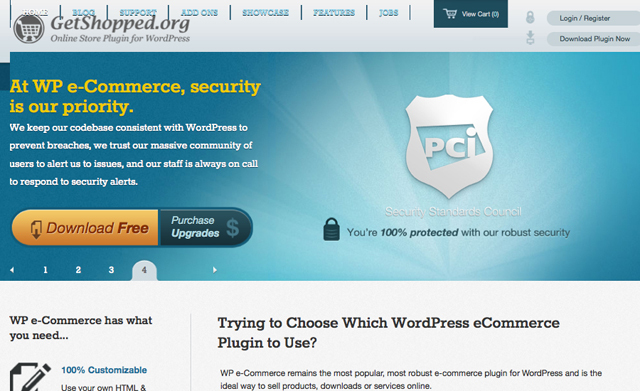 Just like the Paypal Donations plugin, getShopped installs into the WordPress Dashboard and creates its own series of administration pages where every payment processing option can be customized with user ID’s, merchant account information, and payment preferences. The shopping cart itself can then be deployed to the website using a series of templates that utilizes the existing theme’s header, footer, and stylesheet, to create a harmonious and usable experience. The goal of the plugin is to promote usability and commerce by integrating a shopping cart solution into an existing design’s look and feel. That familiarity is the key to encouraging readers to turn themselves into customers at most websites. The shopping cart solution itself can also be styled independently of the theme’s stylesheets, as users can customize built-in, cart-specific template files and even generate their own buttons and interface elements. While the getShopped plugin is not free, its price is generally accessible and users will find it a great way to turn a typical blog into a place that generates good revenue over time. For products that need to be shipped, the getShopped plugin can integrate Paypal payments with the production, printing, and tracking, of a shipping label for a number of worldwide shipping partners. That includes the U.S. Postal Service in the United States, as well as UPS and FedEx options for global commerce or more expedient package shipping options domestically. As the market for printed media has declined in recent years, major publications like the New York Times and the Wall Street Journal have resorted to charging a fee for their online content. This fee helps to cover the significant losses that they’re facing on the print side of things, and it forces most heavy readers to step up to a premium subscription if they intend to get the latest news, sports, and commentary online. This might seem like an inappropriate example when compared to WordPress blogs, but there’s actually a key piece of information here: These newspapers have opened the door to premium online written content. Even though the vast majority of personal WordPress blogs have never had a printed counterpart, nor do they aspire to have such a thing, they are still able to benefit from paid models for full access to their written content. After all, now that major newspapers have taken the first plunge, independent content creators would be foolish not to seize this new opportunity for income. Unfortunately, WordPress itself does not enable this kind of subscription-based posting on its own. The software certainly allows for free user registration, and it allows administrators to place those users into a number of difference permission-based “roles,” but those roles cannot be sold, bought, or paid for, in any way. That is, of course, unless the website’s administrator installs a plugin and brings Paypal into the fold. A plugin known as Your Members actually allows WordPress website administrators to place a premium on some or all of their content. This “walled” approach to content generation will prompt regular readers to pay a small fee in order to access more than a few articles each day, week, or month, and it will guide them through Paypal as they make a one-time or recurring payment for the right to access all of a website’s content. This solution is great for independent sites, but it’s probably best utilized on medium-sized websites that have a bit of extra money to spend, as the plugin costs at least $100 to purchase initially. That can be a steep up-front investment for some blogs but, for those with a healthy amount of excellent content, it’s a small price to pay when generating heft monthly revenues based solely on the production and sale of well-written articles. 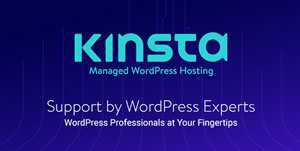 Furthermore, the plugin comes with a lifetime subscription, meaning a one-time purchase enables all future updates released by the developer as new versions of WordPress require compatibility upgrades. Facebook and other social media integration is also included with this plugin, allowing visitors to announce that they’ve purchased a paid subscription to the website via Paypal, and that they recommend their friends take the same steps. That’s a great way to promote viral marketing, and it should be considered a worthy added bonus alongside Paypal integration and increased monthly revenues for blogs that go with the Your Members plugin. It’s not easy or cheap to run a highly popular blog on the Internet. Indeed, hosting expenses, broadband overage charges, and software licensing fees, can make running a website incredibly expensive. Rather than be bogged down by these fees, administrators should embrace the convenience and dominance of Paypal as a way to sell their content or products to their users. Whether it’s by encouraging users to donate or “buy me a beer,” or by using traditional e-commerce tools like paid subscriptions and shopping carts, integrating Paypal is as easy as using a sophisticated plugin and a discerning mind. With the right promotion and incentives, readers will gladly help their favorite sources of content reach profitability in no time.